The Ginkgo Biloba tree is one of the oldest living tree species on the planet, potentially dating back 270 million years and Ginkgo Biloba for memory can be traced back nearly as far. Native to Chinese land, the tree grows best in highly moist and “disturbed” environments such as the Tianmu Mountain, or Tianmushan. Stream banks, rocky slopes, and cliff edges are characteristics ideal for Ginkgo Biloba growth. If the growing conditions are satisfactory, a Ginkgo Biloba could live up to 1,000 to 2,500 years. Ginkgo Biloba has also been planted in Korea and Japan and the tree is naturalizing into forests. The supplements utilized for medical reasons are derived from the tree’s leaves. 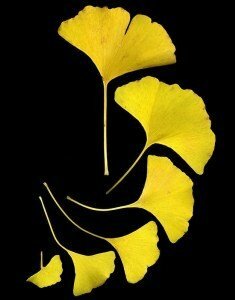 There are actually 40 compounds of Ginkgo but only two of them are used medically: flavonoids and terpenoids. Flavonoids may protect nerve cells, heart muscle, and blood vessels while terpenoids may improve blood flow. Therefore, Ginkgo Biloba may improve blood flow to the brain and may also protect nerve cells from damage. Many claim that Ginkgo Biloba may improve memory and cognitive functioning in healthy individuals and may also improve memory in elderly persons with cases of dementia. In Europe, Ginkgo is widely used to treat patients with dementia. Several studies have been performed to test these claims. Although previous studies demonstrated that Ginkgo improved memory in dementia patients, one recent study claims this is simply be a placebo effect. Results show no improvement of memory for elderly patients with dementia but slight memory improvements were displayed in healthy individuals. A possible explanation follows: the cause of dementia is damage to the brains nerve cells which then leads to memory loss. Once a nerve cell is damaged, it is unable to be repaired. However, a healthy individual has functioning brain nerve cells and Ginkgo Biloba will simply improve the blood flow to the brain and further protect the nerve cells. This may then lead to improved memory functioning. Further research is recommended for further understanding. The typical dosage amount ranges from 120 mg to 600 mg per day. To start, low doses of 120 mg is recommended and then as time progresses, gradually increase the dosage. On average, 240 mg is the average dosage amount for healthy individuals. Other side effects may include dizziness, rash, upset stomach, and/or headaches. These side effects were reported in rare cases but consult your doctor before taking Ginkgo Biloba. “Ginkgo Biloba.” University of Maryland Medical Center. University of Maryland Medical Center, n.d. Web. 04 Feb. 2014. “Vitamins and Supplements Lifestyle Guide.” WebMD. WebMD, n.d. Web. 04 Feb 2014.